11.22.63 hurtles viewers deep into the unpredictable darkness of the American dream. James Franco stars as Jake Epping, a high school teacher at a loss with his life, who wants to make a difference and do something meaningful. 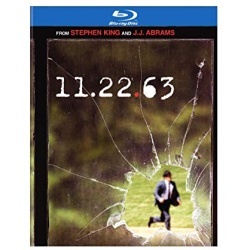 Encouraged by his ailing friend (Chris Cooper), Jake journeys back in time to prevent the assassination of President John F. Kennedy. The story transports audiences into the world of 1960s Texas as Jake explores the multiple mysteries surrounding the alleged assassin Lee Harvey Oswald. But Jake's mission faces threats not only from Oswald, but from Sadie, a beautiful librarian he falls in love with, and from the Past itself... which doesn't want to be changed. And if the Past doesn't want to be changed, it will push back - often violently. With something for everyone, this edge-of-your seat mystery offers an epic and emotional thrill ride.